Chalice Farms Powell The Southeast Portland Chalice Farms store is located on the border of the South Tabor/Foster-Powell neighborhoods. We’re right next door to the historic Powell House Cannabis Club. Visit us on your way to up to the nearly 200 acre Mt. Tabor park, amazing views along with an abundance of flora and fauna. With a sampling of great food carts nearby, and practically surrounded by renowned Portland restaurants, we’re the perfect beginning and end to your dining experience. Chalice Farms is a seed to sale, lifestyle cannabis company based in Oregon; inspiring the eternal search of the adventurous spirit - embracing community, wellness and lifestyle. 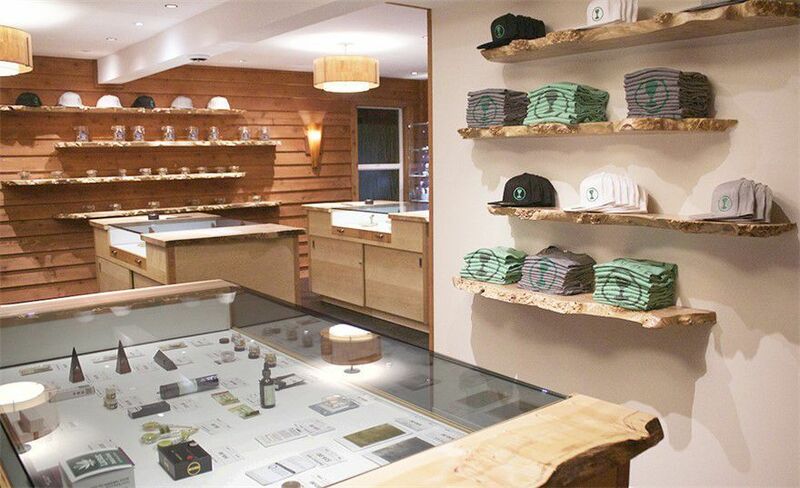 Our retail stores provide the highest quality flower and a variety of locally-sourced extracts and edibles. Designed with modern and open floor plans, featuring custom-made live edge burl wood furniture, you’ll enjoy our clean uncluttered atmosphere, making your shopping experience both unique and memorable. At Chalice Farms, you’ll find friendly and knowledgeable Product Specialists ready and willing to offer product suggestions that best suit your individual needs. We are proud to partner with fellow Oregonians, Mary Jane’s House of Glass, featuring a wide selection of their beautifully made, one-of-a-kind glass works of art. We also offer dedicated parking spots, we’re wheelchair accessible, and since we are cash-only, you’ll find our onsite ATMs make checkout a breeze. Discounts are available for OMMP members, and as a thank you to our veterans and seniors we extend specials discounts to you as well. Ask your Product Specialist for details.